I tried making meatballs for the first time back in August. And, in my typical fashion, I couldn't get myself to actually follow the recipe. Brown and then bake? Too many dishes and too much work. Soften onions? Sure, it would probably be tasty, but for a meal that takes a good chunk of time, the last thing it needs is an extra ten minutes. 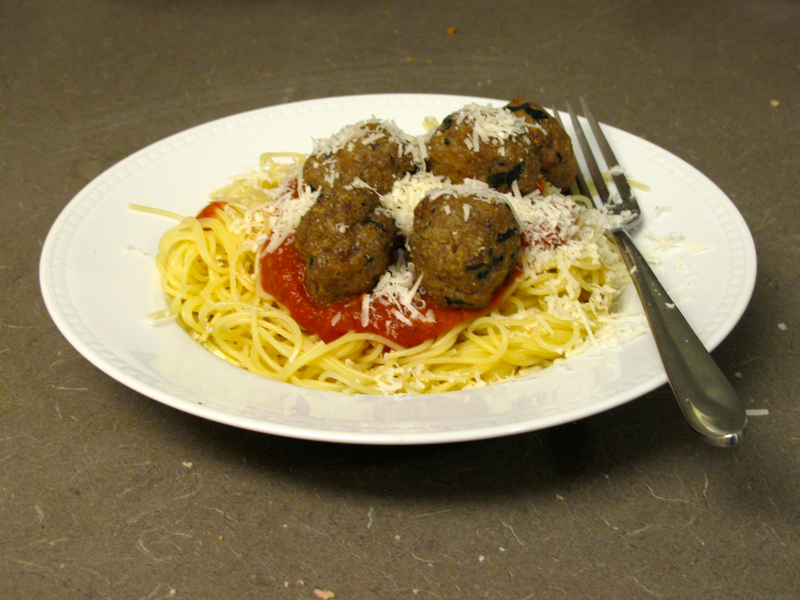 So, after manipulating the poor starter recipe until it was unrecognizable, I finally had my meatballs. My husband's response to them? That I should open a restaurant—he knows exactly how to stroke my ego. After trying it a few more times to make sure they weren't a fluke, I thought I'd share. Toss the spinach in a pan with a teaspoon of water and let it wilt while you measure out everything else into a medium bowl. 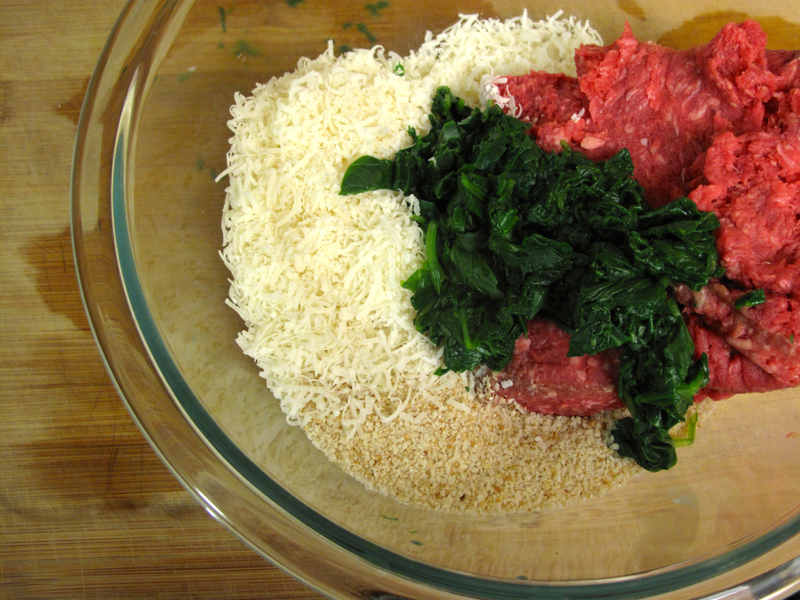 Stir the spinach between measurements, and by the time you're done with everything it should be ready to drain and chop. 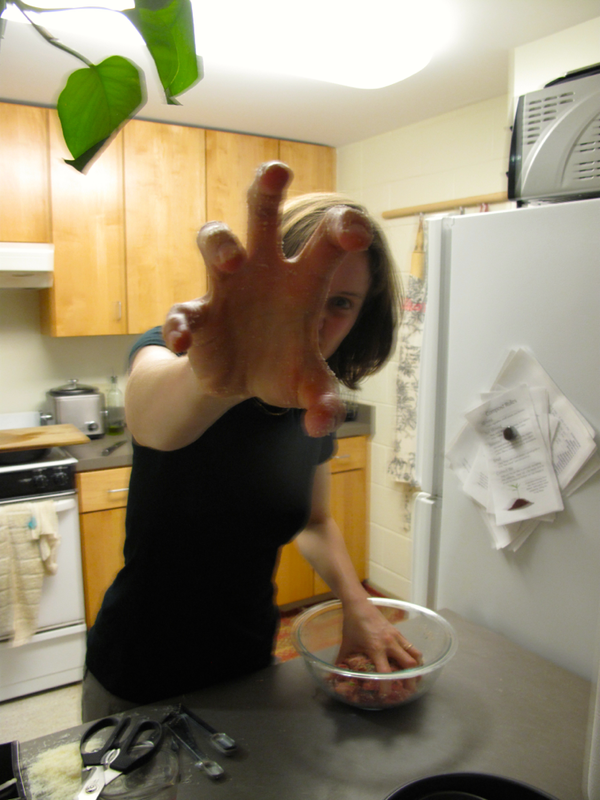 Add the chopped spinach and mix everything together—I just use my "monster hands." Roll into balls--mine have a diameter of about 1-1.5 inches, which makes around 40. Oil a jellyroll pan (the edges help them not roll off) and bake at 375 for 20 minutes. Once they're in, you can start the water for the pasta. Serve with the classic spaghetti or angel hair pasta and marinara sauce, topped with parmesan cheese to taste.